Inventory We are a resale marketplace, not a box office or venue. Ticket prices may exceed face value. This site is not owned by Soldier Field . Soldier Field (formerly Municipal Grant Park Stadium) is located on Lake Shore Drive in Chicago, Illinois, and is currently home to the NFL's Chicago Bears. It reopened on September 29, 2003 after a complete rebuild (the second in the stadium's history). With the current stadium capacity of 61,500, Soldier Field became the smallest stadium in the NFL when the Indianapolis Colts moved out of the RCA Dome and into Lucas Oil Stadium in 2008. With all of the history that Soldier Field has been a part of I doubt that the fans of Chicago would want a newer bigger stadium. But that seems to be the trend in the NFL and other sports as well. 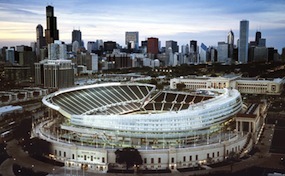 Summertime in Soldier field has hosted a number of concerts in the past as well as soccer matches via the Concacaf Cup. Soldier.FieldChicago.com is not affiliated with any primary box office or supplier. We are a privately owned and operated business specializing in sales in the secondary market. To buy tickets for any Soldier Field Stadium events in Chicago simply click on the event of interest or call our operators at anytime.